A business just starting out may not have all of capital needed for expensive software. If you are in a business where you sell inventory, it is important to keep control of your parts. 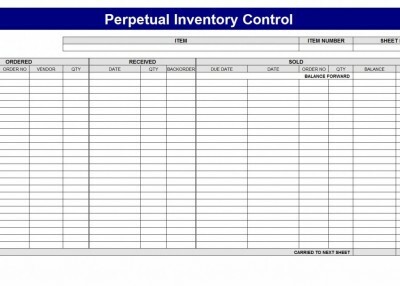 You can always start with something simple, like this Inventory Control Spreadsheet. An inventory control spreadsheet is vital for a business because it is a recorded history of products purchased. To keep an accurate record, this should be updated daily for your entire inventory. This spreadsheet is easy to use. It’s a simple spreadsheet with no complicated formulas. Once you’ve downloaded this spreadsheet from here, you are free to customize it for your business needs. You will appreciate how this can meet your needs and can save your company money because it’s free. Once you have opened the spreadsheet, enter the name of the item in cell E6. Next, enter your item number in cell K6. Finally, you will enter on this row your sheet number. Notice, the Carried To Next Sheet number will update automatically at the bottom of the spreadsheet, as the number to carry over. Now save the spreadsheet with something you can easily identify, perhaps just the item name and item number. In cell M10, input your beginning balance inventory count. It is important to note, you must start entering your inventory information on row 11. Now you are ready to use your inventory control spreadsheet. At this point, if you prefer to print it, you may do so. You may also just use it electronically. You have three sections: Ordered, Received, and Sold. In the parts ordered section, enter the Date you ordered the item, the order number, the vendor you ordered the part from, and the quantity ordered. Next, in the received section, enter when you received the item, how many you received, how many are on backorder with the vendor, and its due date. Your final column, Sold, indicates when you sold the item, the order number, how many were sold, and your beginning balance of inventory items from the original order date. There is also a section for comments if needed. Your balance of inventory in stock is automatically updated. Once you have completed your first sheet, you may right click the tab name, select move or copy, and check the box “Create a Copy” and “Move to End”. Clear the data in the new spreadsheet and update your inventory number from the prior sheet’s carry over cell into the balance forward cell. The Inventory Control Spreadsheet found here is a great inventory control sheet for beginners to use or to help start-ups and small businesses.